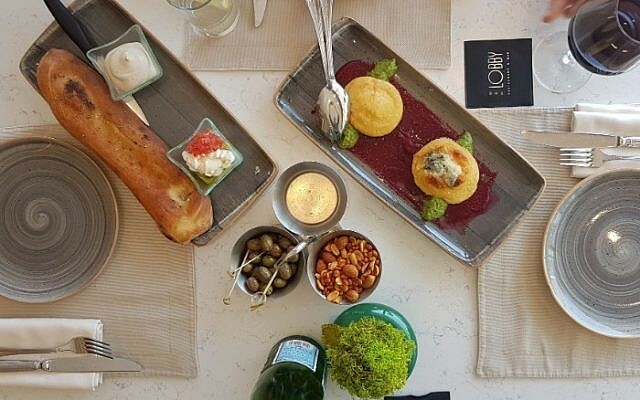 As part of the renewal of Hilton Tel Aviv, in which extensive areas of the hotel were refurbished, chef Rafik Jabarin introduced a new menu at the Lobby bar restaurant with some culinary surprises of modern creative cuisine. The new menu is the creation of Chef Jabarin (49), the executive chef of Hilton Tel Aviv since 2015. He has gained experience at a considerable number of restaurants, such as in Hilton Metropole and Hilton on Park Lane in London, “Laurent” restaurant in Paris, “The Square” restaurant in London and others under famous chefs Anthony Marshall Alain Pegouret, Philip Howard, and others. 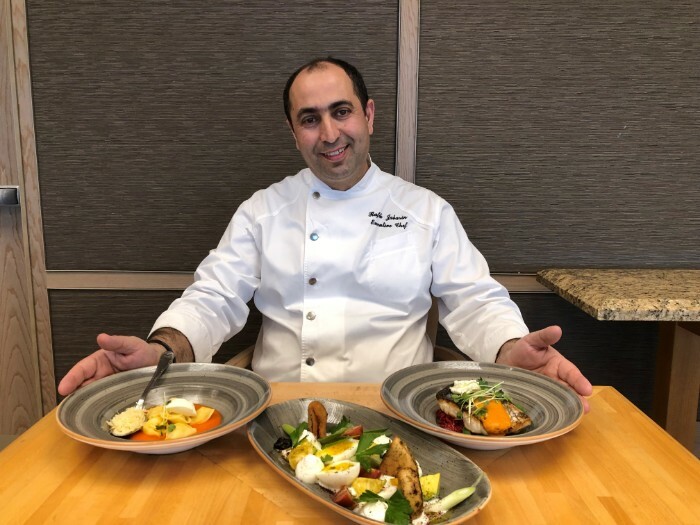 Rafik has held culinary festivals at the invitation of the Foreign Ministry for Israeli embassies abroad; an experience that brought him closer to food and tastes of different kitchens around the globe. Chef Jabarin’s credo is cooking with fresh products, herbs and low-fat ingredients. However, he is also a great advocate of traditional French cuisine. 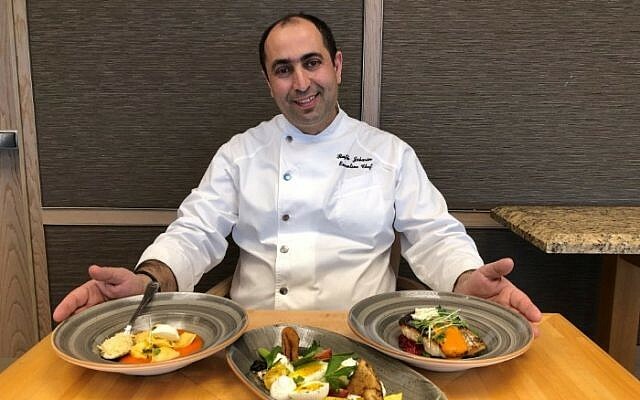 Chef Jabarn says that the menu at the lobby combines Israeli, Mediterranean, French and Italian dishes and is based on favorite dishes popular among Hilton’s guests, such as onion soup, Caesar salad, Nicoise salad, fish and chips, etc. As part of the spring renewal, the classic dishes were refreshed with new variations and interpretations of Jabarin. For example, the fish and chips dish now includes pea cream, and the Nicoise salad received a touch of dates in the dressing. 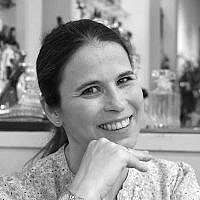 The new menu is based on fresh Israeli ingredients such as fish, beans, pistachios and local herbs. Some of the plates offered in the menu are Cheese soufflé with blue cheese, cheddar and parmesan on beetroot and pesto celery cream (NIS 61), Meagre fillet Served with creamy beetroot risotto, bouillabaisse sauce and cheese fondue (NIS 127), Eggplant Steak – Vegan! Seared Eggplant on a hot skillet, black lentils, root vegetables ragout, bok choy and Asian Tahini sauce (NIS 66), and Hot Turkish Baklava filled with pistachios, served with vanilla ice cream (NIS 48). We tried a few of the new plates, and can highly recommend two of them; the cheese soufflé is a treat – it looks like mini pancakes that are served on a purple beetroot base, they are soft and fluffy with a rich flavor of cheese and a twist of blue cheese and celery pesto cream that makes it a celebration of colors and tastes! 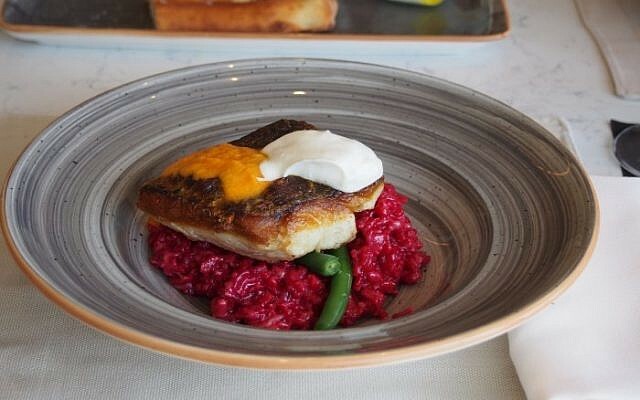 The other is the Meagre Fillet on beetroot risotto, which is perhaps the flagship of the menu, and its looks and taste justifies that! It looks beautiful and it is delicious! The fish is tender and the risotto is silky. Excellent! 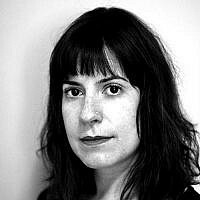 Disclosure: I was a guest of the Lobby bar restaurant.